About 2,500 Syrians have fled into neighbouring Turkey to escape the unrest in Jisr al-Shughur and other towns, according to the UN and Turkish officials. Refugees started entering Turkey on April 29, according to the UN High Commissioner for Refugees (UNHCR). But the flow of refugees has increased sharply this week. More than 1,000 people crossed the border in the last 24 hours, the UNHCR said on Thursday. Ahmet Davutoglu, the Turkish foreign minister, said the figure had now reached 2,500, the Turkish news channel NTV reported. Most are being housed at a refugee camp in Yayladagi, a town about 10km from the border and 25km from Jisr al-Shughur. 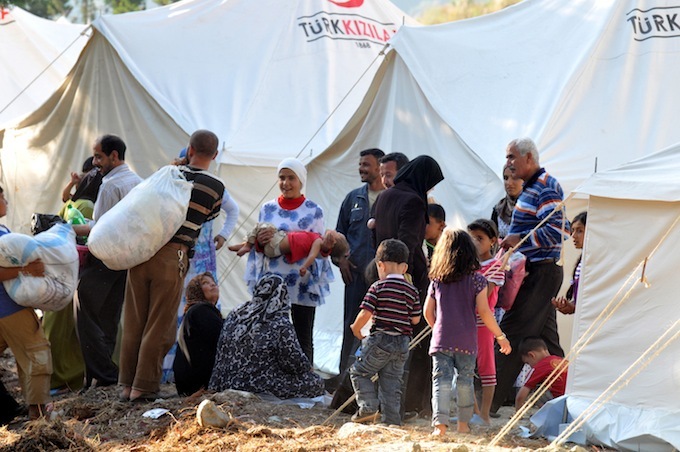 Syrian refugees who fled Syria for Turkey arrive at a refugee camp in Yayladagi village in Hatay, Turkey, 08 June 2011. Dozens of white tents have been set up in the camp, and ambulances have been carrying wounded people to hospitals in Antakya, the capital of Turkey’s southern Hatay province. Roughly three dozen refugees have been treated in Antakya for gunshot wounds, according to Turkish media reports. Metin Corabatir, a spokesman for the UNHCR office in Ankara, the capital, praised the Turkish government’s handling of this newest wave of refugees. “We have been working closely with the Turkish government, and in general they have been doing a good job providing for the refugees,” Corabatir said. The Turkish Red Crescent, which is providing medical care and basic supplies for refugees, declined to comment. Turkish Prime Minister Recep Tayyip Erdogan said on Wednesday that Turkey will not “close its doors” to Syrians fleeing conflict. Many of the newly-arrived refugees are coming from Jisr al-Shughur, where 120 members of the Syrian security forces were reportedly killed earlier this week. After the Syrian government vowed to retaliate, many residents fled, fearing a crackdown. The alleged killings cannot be independently verified. Newly-arrived refugees could describe the conditions in Jisr al-Shughur, but the Turkish government has largely barred journalists from interacting with them. Police guard the entrance to the camp, and local officials have been instructed not to talk to the media. The Turkish foreign ministry said this was not a new policy, and that refugees from other conflicts – such as the war in Iraq – have been similarly shielded from journalists. Corabatir echoed that statement, saying there might be concerns for the safety of the refugees and their families in Syria. “This has been the policy of the Turkish government, when they have large numbers of people who cross the borders, they do not allow journalists to talk to the refugees,” Corabatir said. Turkish officials say they are preparing for the possibility of more refugees in the coming days; the camp at Yayladagi can hold up to 5,000 people, and a second camp is “under consideration,” according to local media. Video shot near the border shows dozens of Syrians camped out in a field on Syria’s side of the border, apparently trying to position themselves for a quick exodus. “We have taken all necessary precautions in case of a massive flow of crossings,” Davutoglu said in a Turkish television interview on Wednesday. 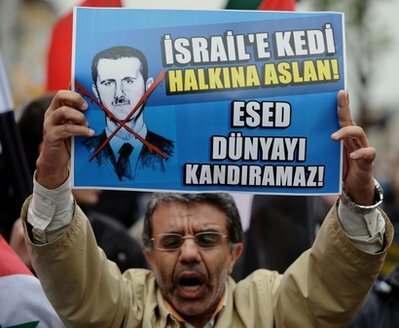 A man displays a banner in Turkish which reads: ' (Assad) a cat to Israel, a lion to his own people. 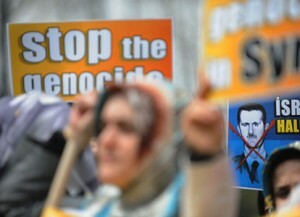 Assad cannot fool the world!' as pro-Islamic activists protest against Syrian leader Bashar Assad for his security forces' violent crackdown of protests there, following Friday prayers at a mosque in Istanbul, Turkey, Friday, April 29, 2011. Lebanon, Syria’s neighbour to the west, has already absorbed some 5,000 refugees, though the UN says it is a “fluid population” and some of the refugees have already returned home. The Lebanese government has not released exact statistics on the number of refugees, most of whom receive services from residents of border towns rather than government agencies. “In general there are a lot of family links [across the border],” said Nadim Houry, a researcher with Human Rights Watch in Beirut. what a shame to see a head of state ordering his army to relocate from the borders with Israel and occupy their own towns and destroy them… I do not think this ever happened in history… Only in Syria ASSAD….Hafiz AlAssad should be proud of his son, 1300 hunded casualities in 2 months for few soldiers… wow he is a great leader….. and Shame on the rest of the Arab leaders and the international community to watch what has been going on every day and still silent or waiting to see who will come through to support…..what is world coming to, kids have been mutilated, their eyes were pulled out, their teeth are pulled out and shot with at least 5 or six bullits in the nose, mouth, heart etc….as the Lebanese singer shout… al shaab al araby wien, wien al malaeen….. watching Turkisk soap opera…..this is a time where you feel ashamed that you can’t reach out and help those Syrian women and chirldren chased by thugs and shut in the back…. I guess if the Turks keep silent, and also don’t let the refugees speak, then all will be quiet on the borders. Silence is SO golden …. This is a real tragedy!People fleeing from their own country because of Fear!These people; children and women and men have the right to be protected !